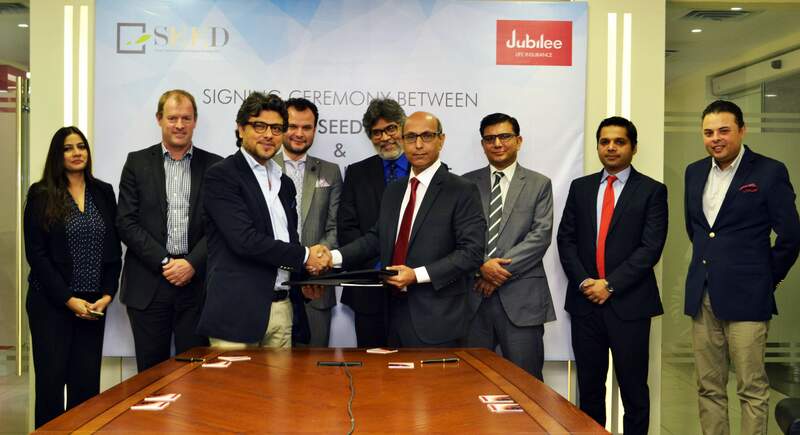 Karachi, November 28, 2017: Jubilee Life, Pakistan’s leading life insurance provider, has partnered with SEED Ventures for the 2nd Enterprise Challenge Pakistan, a Prince’s Trust International programme. This was announced at the project signing ceremony held recently at the Head Office of Jubilee Life. The signing ceremony took place between Mr. Javed Ahmed, MD & CEO, Jubilee Life and Mr. Faraz Khan, CEO & Co-Founder, SEED Ventures, in the presence of Mr. Jonathan Townsend, CEO, Prince’s Trust International. Enterprise Challenge Pakistan (ECP) is a pan-Pakistan, inter-school competition that encourages young people to explore entrepreneurship as a career path. It is offered to secondary school students within the age bracket of 13-16 years in various schools across the country. ECP is essentially a simulation business challenge where students playing in teams of four or five employ their creativity in cyber-scenarios. Each team is mentored by industry experts to help these students understand the basics of an enterprise, business strategy and financials. The objective is to profitably run an enterprise and the team with the highest net profit is declared the winner. Prince’s Trust International is the most recent addition to The Prince’s Charities, formally launched in 2015 to share the successful programmes and expertise of His Royal Highness The Prince of Wales’s youth charity, The Prince’s Trust. Over 40 years The Prince’s Trust has helped more than 870,000 disadvantaged young people across the United Kingdom to turn their lives around; three in four young people supported move into work, education or training. Prince’s Trust International works in partnership with the private sector, governments, and civil society in countries around the world to support young people aged 13-30 into work, education or training. By working with local partners Prince’s Trust International create opportunities for young people in communities around the world to thrive and support them to build their skills and confidence. ECP, an initiative of Prince’s Trust International, is executed in Pakistan by SEED Ventures as the local Founding and delivery partner. The competition also runs in Jordan and the United Kingdom. In its very first year the programme was delivered in 10 cities in Pakistan with over 300 students from 20 schools participating in the competition, supported by over 40 mentors. In two years, Enterprise Challenge Pakistan has been delivered in 28 cities and reached over 10,000 students with 675 participants in 2017. Jubilee Insurance is a global brand of Aga Khan Fund for Economic Development (AKFED) that offers diverse insurance solutions (life, health and general) in the Asian and East African markets. Jubilee Life in Pakistan offers uniquely designed range of life and health insurance plans, catering to various customer segments and needs. These include retirement, child education, marriage, saving & protection, wealth accumulation, life insurance plans for women, rural insurance plans and life and health insurance solutions for the less privileged of our country. The company also recently launched Takaful business to cater to all Pakistanis.